Food is always a beautiful reason to gather us together and to make time passes at a slow speed. What better souvenir to bring from Iran than its refined and delicious cuisine? The best way to take these flavors and aromas to your kitchen is to learn how to cook on your own some of the tastiest traditional Persian dishes! Come alongside this tour to pierce the secrets of those culinary delights. 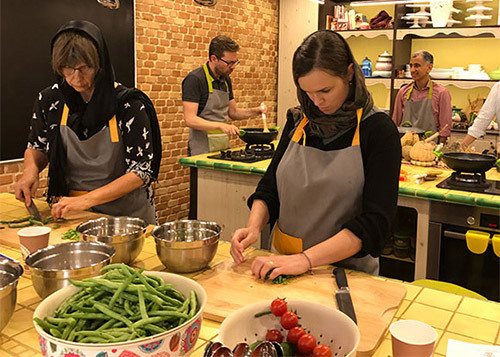 The Tehran "Shop, Cook, Feast" Tour offers to both experienced cooks and simple food lovers the opportunity to discover Iran through its food culture, in half a day. 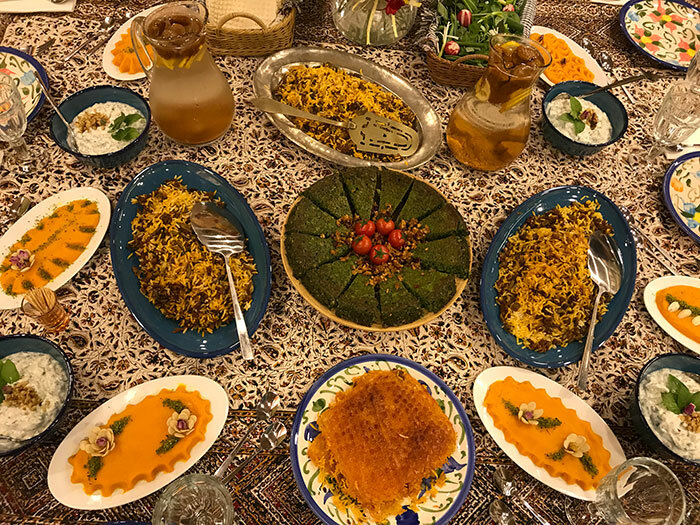 This tour will reveal you the secrets and history of the Persian cuisine and can be a perfect introduction to your trip to Iran. Your adventure will start in the bazaar of Tajrish, located in the North of the capital city of Tehran. Tajrish Bazaar is one of the most beautiful bazaars of the Iranian capital, with its preserved traditional architectural style and you can easily enjoy walking, observing people, local activities, jobs, shopping souvenirs and visiting the holy shrine of Imamzadeh Saleh as the neighbor of Bazaar. While walking through the market, you will be conducted to different food shops. There you will be introduced to all sorts of local ingredients and spices that give its authenticity to Persian cuisines. Your guide will explain you their usage and history, before you'll start shopping for the fresh ingredients you'll need for your cooking class. Then chapter of kitchen begins. With chef advice and under her guidance, you will prepare a five dishes meal made out of seasonal products. And when the kitchen will be filled with all those delicious aromas, it will be time for you to relax, and enjoy the result of your work by gathering around the table to eat and exchange altogether. The tour starts at 9:30 am at Tajrish square, where you will meet your guide and the rest of the group. 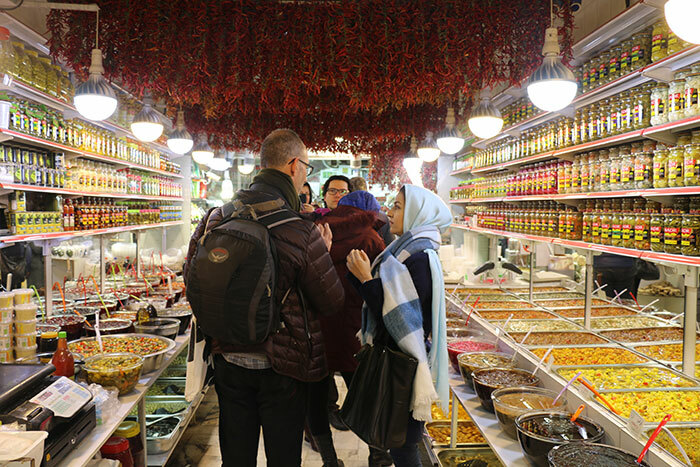 Together you will visit the alleys of Tajrish bazaar and old and historical district and structures like houses, narrow alleys before shopping fresh and seasonal ingredients for your cooking lesson. From Tajrish, you will be conducted by car to the kitchen, located in the north of Tehran, not far from the bazaar. 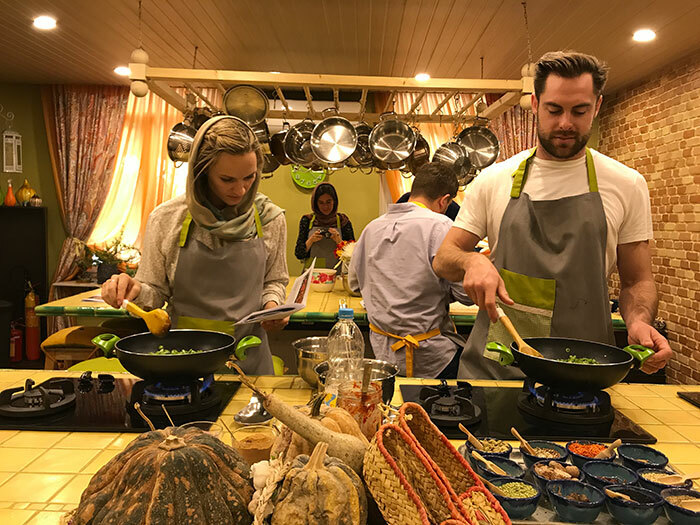 In the kitchen, you will spend some hours learning the tips and tricks of Iranian culinary and gastronomy and prepare a five-course meal. At the end of the tour, you will sit around the table with all the others participants to enjoy and share altogether the delicious meals you prepared. The tour ends at 3:30 pm, at kitchen.